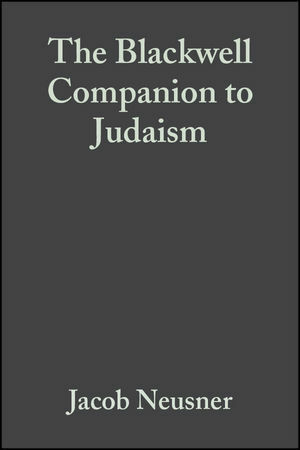 This Companion explores the history, doctrines, divisions, and contemporary condition of Judaism. Jacob Neusner is Distinguished Research Professor of Religious Studies at the University of South Florida and Professor of Religion at Bard College. He has seven honorary degrees, fourteen academic medals and has published more than 800 books. 1. Defining Judaism: Jacob Neusner (University of South Florida and Bard College). 2. The Religious World of Ancient Israel to 586: Marvin Sweeney (Claremont School of Theology and Claremont Graduate University). 3. Judaism and the Hebrew Scriptures: Philip R. Davies (Sheffield University). 4. Second Temple Judaism: Frederick J. Murphy (College of the Holy Cross). 5. The Formation of Rabbinic Judaism, 70-640 C.E: G_nther Stemberger (Universitat Wien). 6. The Canon of Rabbinic Judaism: Jacob Neusner (University of South Florida and Bard College). 7. Judaism and Christianity in the Formative Age: Bruce D. Chilton (Bard College). 8. Judaism in the Muslim world: Sara Reguer (Brooklyn College of the City University of New York). 9. Judaism in Christendom: David R. Carr (University of South Florida). 10. Philosophy in Judaism: Two Stances: Daniel Breslauer (University of Kansas). 11. Jewish Piety: Tzvee Zahavy (Fairleigh Dickinson University). 12. The Doctrine of Torah: Jacob Neusner (University of South Florida and Bard College). 13. The Doctrine of God: Alan J. Avery-Peck (College of the Holy Cross). 14. The Doctrine of Israel: Jacob Neusner (University of South Florida and Bard College). 15. The Doctrine of the Messiah: William Scott Green (University of Rochester). 16. Language as Doctrine: Hebrew: David Aaron (Hebrew Union College-Jewish Institute of Religion). 17. Reform Judaism: Dana Evan Kaplan (University of Wisconsin-Milwaukee). 18. Orthodox Judaism: Benjamin Brown (Hebrew University). 19. Conservative Judaism: The Struggle Between Ideology and Popularity: Daniel Gordis (University of Judaism). 20. New Age Judaism: Jeffrey K. Salkin (Port Washington, New York). 21. Ethics of Judaism: Elliot Dorff (University of Judaism). 22. Women in Contemporary Judaism: Judith Baskin (University at Albany, State University of New York). 23. Judaism as a Theopolitical Phenomenon: Daniel J. Elazar (Jerusalem Center For Public Affairs). 24. Theology in Contemporary Judaism: Neil Gillman (Jewish Theological Seminary). 25. Secular Forms of Jewishness: Paul Mendes-Flohr (Hebrew University). 26. Judaism and Zionism: Yosef Gorney (Tel Aviv University). 27. The "Return" to Traditional Judaism at the End of the Twentieth Century: Cross Cultural Comparisons: M. Herbert Danzger (City University of New York). "[T]he contributors place Judaism in historical context, elaborate on its principal doctrines, introduce forms of modern and contemporary Judaism, and shed light on special topics in understanding contemporary Judaism, such as ethics, women theopolitical aspects, secular forms of Jewishness, and Zionism." "Comparative, comprehensive and highly readable, Matthewes' book provides an overview of religious ethics in three traditions without sacrificing the specificity of each ethical system. The author effortlessly enlightens the reader as to how Judaism, Christianity and Islam deals with highly relevant topics such as family, love, sexuality, lying, war, capital punishment and many more themes in a provocative and graceful manner." Surveys those issues most relevant to Judaic life today: ethics, feminism, politics, and constructive theology. Explores the definition of Judaism and its formative history. Makes sense of the diverse data of an ancient and enduring faith.